How long should GP patient/medical records be kept for? Home/Blog, Lloyd George/How long should GP patient/medical records be kept for? The Information Commisioners Office (ICO) is the UK’s independent authority set up to uphold information rights in the public interest. A recent blog of the ICO’s was titled ‘NHS patient information and the Data Protection Act’ and here is a little snippet from that blog “The health sector always provides a wealth of data protection challenges, but without doubt the one currently at the forefront of most peoples’ minds are the changes to how patient information in England could be used by NHS bodies and others, with a view to improving care and health services.” Read the full ICO blog by clicking here! 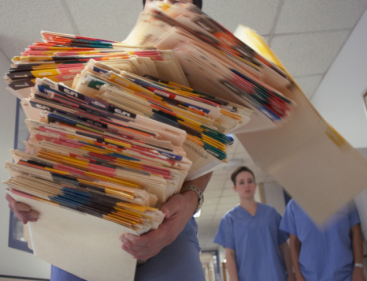 One concern the health sector face when it comes to records management is how long should a records be kept for! Knowing how long you should retain physical and electronic records is difficult especially as the Data Protection Act does not state requirements for how long each sector and each type of record should be kept for! However the Department of Health has offered guidelines for those working in the NHS for the full NHS Code of Practice for Records Management please click here! The NHS Choices website offers the following guidance for how long medical records (health records) should be kept for? “GP records should be retained until 10 years after the patient’s death or after the patient has permanently left the country, unless they remain in the European Union. Electronic patient records must not be destroyed or deleted for the foreseeable future.” Please click here to view the full page! DataSpace are pleased to offer NHS organisations and General Practices with secure physical and electronic storage and management facilities for Patient Records to ensure that they are safe and secure and are compliant to requirements set out in the Department of Healths NHS IG Toolkit! Does you Practice need more space? Maybe to provide an additional consulting room? Are you worried about CQC and Data Protection compliance of your Patient Records? Do you want to start digitising your Patients Physical Medical Records? If YES to the above contact us today on 0800 028 8956! DataSpace provide bespoke offsite storage and management services for General Practices and Medical Centres for the secure storage and management of your Patients Medical Records. For more information and to discuss your requirements further please call us on 0800 028 8956 or email info@data-space.co.uk we look forward to hearing from you.